Stability and normalization should be the crucial ingredients of Kosovo's future status. If achieved, it would lead to strong economic recovery in Kosovo and to more sustainable economic growth in Serbia. Chances for positive economic development, strong recovery and sustained long-term growth are significant if normalization is achieved. Kosovo's potential growth rate could be close to 7% to 8% per year in the medium run while Serbia could sustain a convergence growth rate above 5% per year. Both would also benefit from a 'peace dividend', i.e., lower security costs. 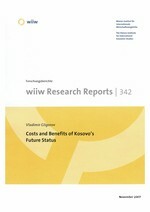 Of the scenarios considered: (i) full Serbian sovereignty, (ii) substantial autonomy for Kosovo, (iii) supervised independence in accordance with Ahtisaari's Plan, and (iv) Serbian and Kosovo partnership of some sort, only the last one would provide for a significant decline of risks, for increased investment and trade, for improved prospects of EU integration and for strong recovery in Kosovo and sustained growth in Serbia, whereas any solution that would be rejected by any of the parties would trigger increased fiscal and security costs and impair investment and GDP.